"Overall, we are able to pick a larger amount of line picks in a shorter period of time. We were picking about 20 hours for a day’s worth of work and we are able to cut that down to 14." LeeSar provides supply chain services to hospital systems throughout Florida. The company was started in 1998 as a partnership between two of these systems as a way to reduce costs for their healthcare supplies. Since that time, LeeSar has grown to include four hospital systems on seven campuses and now employs nearly 500 people. Initial service lines involved low unit of measure medical supplies but over the years expanded to include nuclear pharmacy, compounding pharmacy and the sterilization of surgical instruments. 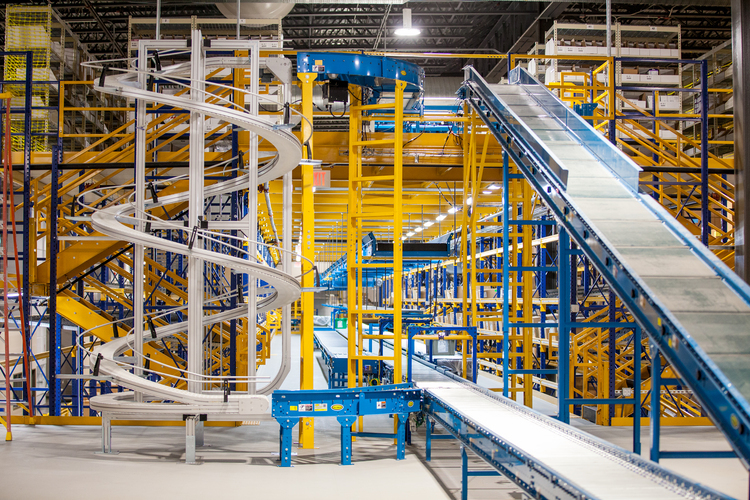 With a rapid growth in volume and the addition of service lines, LeeSar looked to expand their distribution center and find a material handling system to meet growing needs for medical supplies. "We had to come up with A: the space to expand and B: the footprint within that space to adequately distribute that product," said Process Excellence Manager Adam Flood. "The biggest goal for us was figuring out a way to improve our throughput and our accuracy. Year over year we continue to grow and because of that, the number of lines picks that we do or product we pick increases." 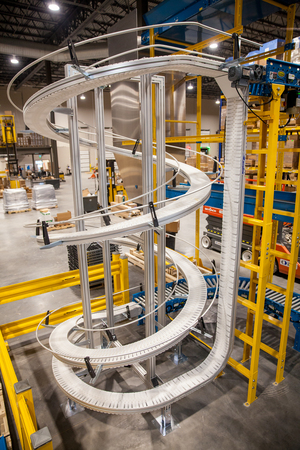 LeeSar SystemLeeSar's system utilizes a Connex spiral to move cartons from one level to another. "With the help of our integration partner and Hytrol, we found a pick module system that we feel meets our needs," Flood said. "It may be different for others, but we’ve taken bits and pieces of ideas that we've seen and made this our own." The system LeeSar installed features a reconfigured picking system that is not only more efficient, but also safer for employees. The previous system included many manual operations where pickers had to carry and lift the totes. 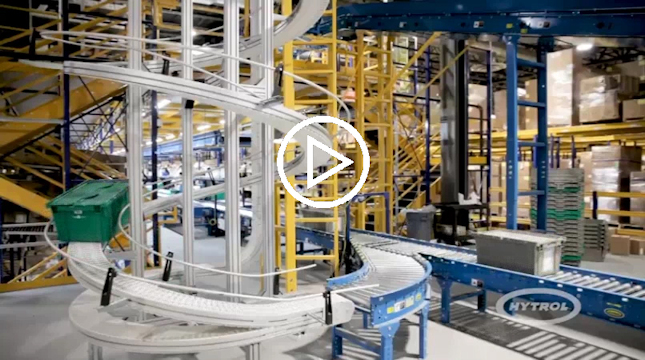 Now, the totes travel to multi-floor pick locations via spiral plastic chain conveyors where they then move along gravity and powered roller conveyors during picking. Once the orders are picked, they are sorted and loaded on to carts for delivery to the hospitals. "We have been able to increase our capacity from about 85 lines (per person) per hour to a little bit over 100 line picks per hour," said Director of Distribution Jeff Schroeder. "Overall, we are able to pick a larger amount of line picks in a shorter period of time. We were picking about 20 hours for a day’s worth of work and we are able to cut that down to 14." To utilize the height of the facility, engineers designed a 3-story Connex spiral with a 13-foot elevation change and 2.5 revolutions at a 13 degree incline. The spirals produce sound levels less than 70 decibels, creating a more hearing-friendly workplace. "By using the spirals that have a vertical lift instead of horizontal floor space to get your incline, there’s less travel," said Hytrol's Manager of Integrator Services Chris Woodall. "There’s less movement of the tote to get it straight up than it is to go out and come back around. So you are saving time. So your throughput is increased by decreased time to get the product from the first level to the second level and from the second level to the third level." An added bonus for the system was the addition of flow racks to the picking module. The racks are designed to bring the products to the pickers, but can be replenished from the back while picking in the front continues. "In a picking system, the idea is to continuously pick without interruption," Flood said. "Previously, we've run into areas that we’ve had to either pick or replenish. Bringing in the Hytrol conveyors with the addition of flow racking has allowed us to replenish without interrupting the picking process." The completed system also offered safety benefits to the LeeSar employees. Increased automation during both transport and picking of products has helped reduce the risk of injury for employees and created safer operations. The spirals provided reduced noise that decreased employee accidents and injuries and has created an overall safer workplace. The collaboration between Hytrol and integration partner provided a boon to LeeSar to complete the project, utilize parts of their previous system, and create the outcomes they wanted. "We worked with our integration partner and Hytrol on a couple of projects prior to this one, dating back about 10 years," said Schroeder. "There’s a level of trust there that this project is going have the outcome we want it to have." "From the end user to the integration partner, it’s always good to see the relationships that we build," said Woodall. "It’s in the relationships that we're going to be there, not just at the start of the sale, but we're going to be there at the end of the sale, any of the maintenance, any of the issues that may arise. They're always going to know that Hytrol stood by them no matter what and the relationship's built."